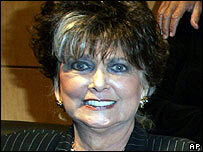 US actress Suzanne Pleshette, best known for playing the wife in 1970s sitcom The Bob Newhart Show, has died. Pleshette was nominated for four Emmy Awards over 30 years and also appeared in Alfred Hitchcock's film The Birds. In recent years, she had parts in TV comedies Will and Grace and 8 Simple Rules for Dating My Teenage Daughter. She was 70 years old and died of respiratory failure at her Los Angeles home, her lawyer Robert Finkelstein told the Associated Press news agency. The actress had chemotherapy for lung cancer in 2006. Pleshette started her career in Broadway in the late 1950s before moving into TV shows such as Dr Kildare and movies including The Birds, in which she played Annie, and Nevada Smith with Steve McQueen. Pleshette provided the voice of reason amid the eccentricity of The Bob Newhart Show from 1972-77, earning two Emmy nominations for best TV comedy actress. She also won acclaim for playing property tycoon Leona Helmsley in a TV movie in 1990.